William Jesse McDonald, known as Captain Bill McDonald (September 28, 1852– January 15, 1918), was a Texas Ranger who served briefly as a bodyguard for both U.S. Presidents Theodore Roosevelt and Woodrow Wilson, opponents, along with incumbent President William Howard Taft, in the bitter 1912 United States presidential election. Captain McDonald was a friend of Colonel House, who convinced the biographer Albert Paine to record the captain's life. In the process of working on said biography, Captain MacDonald made the acquaintance of Mark Twain. McDonald was born in Kemper County near Meridian, Mississippi, but relocated with his mother, the former Eunice Durham, and other relatives, his sister Mary T. McDonald (McCauley), to east Texas after the American Civil War. His father, Enoch McDonald, had been killed in 1862 in the battle of Corinth, Mississippi. The McDonalds settled on a farm near Henderson in Rusk County. At the age of sixteen, McDonald quarreled with federal officials during Reconstruction and was tried for treason but acquitted through the intervention of future U.S. Representative David B. Culberson. He graduated in 1872 from Soule Commercial College in New Orleans, Louisiana. As a young man, McDonald taught penmanship in Henderson until he opened a small store at Brown's Bluff on the Sabine River in Gregg County, Texas. He later established a grocery store in Mineola in Wood County, Texas. Still operating his store, McDonald grew interested in law enforcement. He became a deputy sheriff in Wood County. He was friendly with future Governor James Stephen Hogg, then a justice of the peace in Quitman, the seat of Wood County. It was through Hogg that McDonald met his wife, the former Rhoda Isabel Carter, whom he married in January 1876. In 1883, the couple moved to Wichita County, Texas, and thereafter to Hardeman County, where he was again a deputy sheriff and advanced to special Ranger and U.S. Deputy Marshal for the Northern District of Texas and the Southern District of Kansas. His bold tactics drove the Brookins gang from Hardeman County. McDonald also apprehended cattle thieves and train robbers in "No Man's Land" and the Cherokee Strip. In 1891, Governor Hogg named McDonald to succeed Samuel A. McMurry as the captain of Texas Rangers Company B, Frontier Battalion, a position that he retained until 1907. McDonald and his company were involved in numerous matters throughout the state: the Bob Fitzsimmons-Peter Maher prizefight in El Paso, the Wichita Falls bank robbery, the murders by the San Saba Mob (during which time Mrs. McDonald was in camp with her husband), the Reese-Townsend feud at Columbus in Colorado County, Texas, the lynching of the Humphries clan, the Conditt family murders near Edna in Jackson County, and the shootout with Mexican Americans near Rio Grande City in Starr County. In all of these events, only one Ranger, T.L. Fuller, lost his life under McDonald’s command. In 1893, McDonald was nearly killed in a gunfight in Quanah, the seat of Hardeman County, with Sheriff John P. Matthews of Childress County, Texas. In 1906, McDonald came to Brownsville, Texas, to restore order in what is now known as the Brownsville Affair, in which 167 African-American United States Army soldiers in the 25th U.S. Infantry were falsely accused of causing a race riot. President Theodore Roosevelt gave all of the soldiers dishonorable discharges, having rashly accused them of engaging in a "conspiracy of silence" by not identifying the particular soldiers who may have fired shots that killed a white merchant. Years later, President Richard M. Nixon reversed Roosevelt's directive and cleared the lone survivor among the soldiers as well as posthumous recognition of the other 166 who had already died. As a result of McDonald's actions in Brownsville, he was referred to as "a man who would charge hell with a bucket of water." McDonald and three other officers—John H. Rogers, John R. Hughes, and John A. Brooks—were known as the "Four Great Captains" of the Texas Rangers. McDonald was an outstanding marksman who used his weapons to intimidate and disarm his opponents. Though he had bullets in his body from shootouts, he never killed anyone in a clash. In 1905, McDonald acted as bodyguard to President Theodore Roosevelt, who later entertained him at the White House. His wife died in 1906. There is no indication in Who Was Who in America of any children. McDonald remarried Pearl Wilkirson in December 1914. In 1907, McDonald relocated to Austin to serve as state revenue agent in the administration of Governor Thomas Mitchell Campbell. In that capacity, he increased the state tax valuation by almost a billion dollars in two years. He was later a bodyguard for Roosevelt nemesis, Woodrow Wilson, who named his fellow Democrat as the U.S. Marshal for the Northern District of Texas. McDonald had the skill to track down outlaws, to evaluate physical evidence found at the scene of a crime, and to disarm or defeat mobs. McDonald died of pneumonia in Wichita Falls, Texas. He was buried at Quanah, west of Wichita Falls. His tombstone carries the motto: "No man in the wrong can stand up against a fellow that's in the right and keeps on a-comin'." McDonald is an inductee of the Texas Ranger Hall of Fame in Waco. Other works mentioning McDonald are Walter Prescott Webb's The Texas Rangers (1935) and W.W. Sterling's, Trails and Trials of a Texas Ranger (1968). Harold J. Weiss, Jr., a Pennsylvania native and a professor emeritus at Jamestown Community College in Jamestown, New York, has done extensive research on McDonald. He describes the old Ranger as having "intrigued people with his charisma, bravery, and dynamic qualities." Weiss said that McDonald's exploits often provided fodder for the plots of western novels. Weiss wrote Yours to Command: The Life and Legend of Texas Ranger Captain Bill McDonald (2009). Captain Bill McDonald, Texas Ranger: A Story of Frontier Reform (1909) by Albert Bigelow Paine had been the principal work on the Ranger. Paine's biography has an introduction by Theodore Roosevelt. ^ "Texas Ranger Hall of Fame and Museum: Rhoda and Bill McDonald". texasranger.org. Retrieved March 9, 2010. ^ a b "Charles Bennett, "Legendary Lawman Bill McDonald"". officer.com. Retrieved March 9, 2010. ^ It is unclear whether Enoch McDonald was killed in the Siege of Corinth (first battle) or the Second Battle of Corinth, both in 1862. ^ a b c d e "Harold J. Weiss, Jr., and Rie Jarratt, "McDonald, William Jesse"". tshaonline.org. Retrieved March 9, 2010. 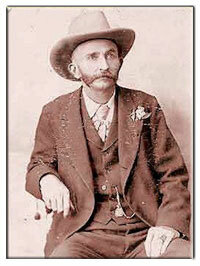 ^ a b c d e f "Texas Ranger Hall of Fame (State Designated Memorial): William Jesse McDonald". texasranger.org. Retrieved March 8, 2010. ^ a b "Harold J. Weiss, Jr., Yours to Command: The Life and Legend of Texas Ranger Captain Bill McDonald". unt.edu. Retrieved March 8, 2010. ^ "Capt. 'Bill' MacDonald Dies. Bodyguard of President Wilson Was Noted Texas Ranger" (PDF). The New York Times. January 16, 1918. Retrieved 2010-07-04. ^ "Captain Bill McDonald, Texas Ranger: A Story of Frontier Reform". amazon.com. Retrieved March 9, 2010. This page was last edited on 25 July 2018, at 19:13 (UTC).